Performing an SEO audit for your website will detail the performance and issues affecting the search engine results along with usability themes. Not only should an SEO audit be performed on a site, it should be a recurring maintenance program that is generated on a consistent basis such as once a month in order to constantly evaluate the performance of a site. With the regularly occurring updates by Google and the other search engines, webmasters and companies can’t rely on a website to produce the same results without adapting to new algorithms. Above is the left side of the analysis view for Forecheck. Forecheck is the perfect tool for creating SEO audits, whether someone needs it for a small site, extremely large site or multiple websites. It’s a dream program for SEO agencies and webmaster teams. With the capabilities to run an analysis on sites of any size, including ones with hundreds of thousands or even millions of URLs, Forecheck provides the user with information on practically all aspects relating to how a search engine crawls a site. Above is the right side of the analysis view for Forecheck. Forecheck analyzes all the URLs of a website and supplies information based on two distinct sets, Server-related and Content-related themes. Under Server issues, Forecheck evaluates the status of URLs, including a variety of Error-handling codes such as 301 redirects, 302 redirects, 404 redirects and many more. Along with status codes, Forecheck provides detailed analysis on Load Time, URLs with Meta-Refresh code, Cloaking, Timeouts and HTTP Header code. Above is the bottom left side of the analysis view of Forecheck. Content is relayed in an analysis through Meta Title tags, Description tags, Duplicate Content, Indexability, noindex, canonical links, robots.txt and more. Above is the bottom right side of the analysis view of Forecheck. But Forecheck offers so much more, including the analysis of internal/external links, Google Analytics, keyword content, Browser content and source code to name a few. 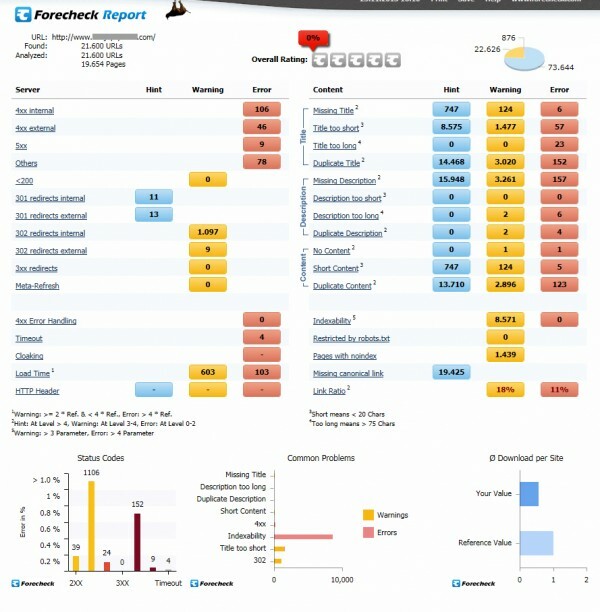 Above is the Benchmark report for Forecheck where you can link to individual reports or the analysis window. A highlight of using Forecheck as an SEO audit tool is that reporting is extremely easy to generate and furthermore highly usable and adaptable. Reports can be viewed in the Analysis mode or the Reports mode, and all features can be filtered according to your desire – group server codes or isolate specific ones, create a report only on 404 redirects, create a report on Title tags (Missing, Too Short, Too Long) and so forth. Reports can be generated in XML and CSV formats, opened in Excel and filtered additionally if preferred. As you can see from these details, it’s extremely simple and efficient for a webmaster or SEO consultant to provide reports on any features provided by Forecheck to anyone in a company or web team. 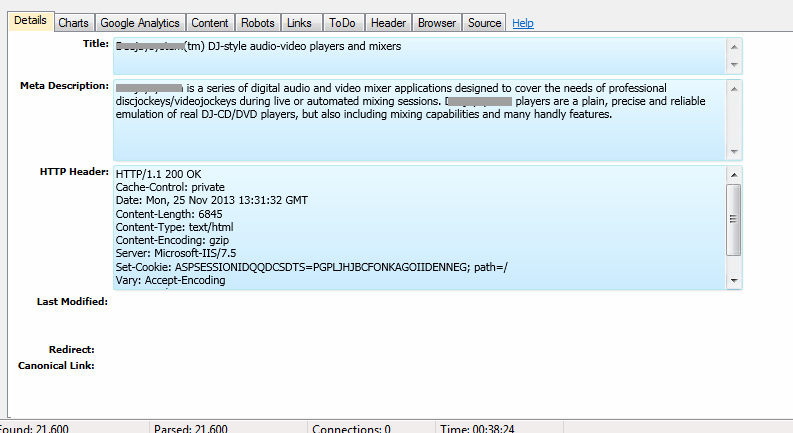 Above is the report format for 302 redirects.